Before making any changes, however, you might want to read the article on the right side of this newsletter with tips on creating Holiday Schedules. If you’re still having problems, our tech support specialists would be happy to help. You can contact them by phone at 1-630-879-6400 or e-mail at Support@TimePilot.com. Q. I have TimePilot Vetro, and I can’t transfer my changes to the clock. The user manual says to go to the Setup Menu in TimePilot Central and then click “Transfer Changes to Vetro Clock Using USB.” I do not have that option in my Setup Menu. What am I missing? A. It appears you are missing the Vetro Data Manager, a small program acts as the "bridge" between TimePilot Central and the Vetro clock. Here's how to get it: Exit TimePilot Central, then insert your TimePilot software installation CD and choose “Install TimePilot Software,” “TimePilot Installation Menu” (not the Installation Wizard) and lastly “Vetro Data Manager.” After installing the Vetro Data Manager you should now have the option to transfer your changes to your Vetro clock. Q. How do I set the time and date on the Tap+ clock? A. First, make sure the Tap Manager is running on your PC, then simply plug the clock into the computer. Three things happen automatically: Clock-in and clock-out data on the Tap+ clock is downloaded to the computer; the time and date is updated on the Tap+ clock (using the time and date on your PC or server); and the battery is recharged. Q. 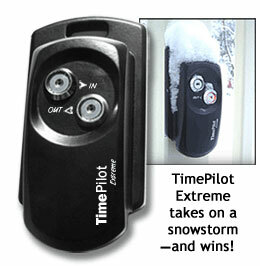 We have a TimePilot Standard clock and use TimePilot software version 4.0. We want to assign an iButton to a new employee, but we can’t find our manual. Can you tell us how to do it? A. Sure can. First, start TimePilot Central and open the employee’s profile. (Setup Menu > Profile Setup > click the employee’s name and then “Edit a Profile.”) Find the “Identification” section on the right side of the profile screen. Type the number directly from the iButton. It's the incredibly-hard-to-see 12‐digit number on the metal face of the iButton. Click “Save” to finish the process. This option isn’t recommended, unless you have the eyes of an eagle. A much better way is to have the TimePilot Standard clock do the work for you. Click the "Get iButton number" button. The "Get iButton Number" box will pop up. Tap the new employee’s iButton to one of the iButton probes on the Standard timeclock. The clock will read the number and enter it into the software. Next, choose the color of your keyfob and click "OK" to close the "Get iButton Number" box. The employee profile should now show the employee’s iButton number and the color of their keyfob. Click “Save” to finish the process. You live in the past. About 80 milliseconds in the past, to be precise. Use one hand to touch your nose and the other to touch one of your feet at exactly the same time. You will experience them as simultaneous acts, but it didn't really happen that way: It takes more time for the signal to travel up your nerves from your feet to your brain than from your nose. The explanation is simple: Your brain waits for all the relevant input before it experiences the “now.” Experiments have shown that the lag between things happening and us experiencing them is about 80 milliseconds. Flash ... Bang: Since light travels at 186,000 miles per second, you see the lightning the instant it flashes. But the sound of thunder travels about a mile in five seconds near the ground. Below is a chart showing the time span between the flash and the bang and your distance from the lightning strike. TimePilot Q&A: Holiday schedules, transferring changes to your Vetro. TimePilot Best Practices: All about holiday schedules. The Deal: 10% off Extreme Starter Kits and additional Extreme clocks.